There is something very special about the Canal du Midi, something that simply makes people fall in love with it. Running from the city of Toulouse down to the Mediterranean, the Canal du Midi is arguably the most beautiful and well-known stretch of inland waterway in Southern France. These days the Canal du Midi is a haven for cyclists from across the world who come to bask in its beauty and soak up the scenery, meandering on the designated bike trails by the river. In the summer the weather is gorgeous, but the colours and its serenity make it an ideal location for spring and fall as well. It is easy to see why it was inscribed as a UNESCO World Heritage Site in 1996. First time visitors will certainly be bowled over by its magnificence and even old hands will find new and exciting things to explore on every visit. It is truly a magical holiday destination. Spanning the regions of the Languedoc-Roussillon and Midi-Pyrénées, the Canal du Midi boasts some unique and truly breathtaking landscapes. The canal passes through a great number of wine growing areas, including the Herault, the Aude, Minervois and Corbieres. You will also see many fields of sunflowers, meander through little villages and past cafes and see a wide variety of wildlife. Stop along the route in the many villages or any of the many vineyards for a wine tasting. 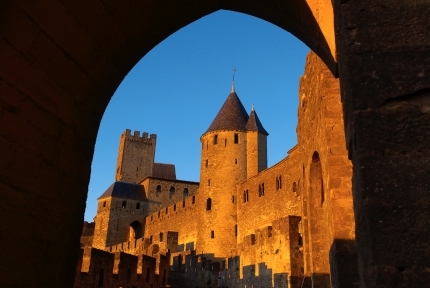 This particular route stops in the ancient cities of Castelnaudary, Carcassone and Narbonne to add culture and history to the mix. Come and experience the magic for yourself.